Palestinians are due to stage marches in both the occupied territories and Israel Thursday to commemorate the loss of their homeland 66 years ago – an event they call the Nakba, or “Catastrophe” – a little more than a week after Israeli Jews celebrated the anniversary of the Jewish state’s birth. But for many Israeli Jews, it is becoming ever harder to mark their Independence Day without confronting the fact that Israel’s establishment created a new set of victims, said Eitan Bronstein, founder of Zochrot, or “Remembering”, an organisation dedicated to teaching Israeli Jews about the Nakba. Long excluded from the Israeli national discourse, the Nakba – and the ensuing destruction of hundreds of Palestinian villages – is slowly forcing itself into the consciousness of ordinary Israelis. And that is creating new sources of tension and potential conflict. Last week, as Israeli Jews held street parties celebrating Independence Day according to the Hebrew calendar, some 20,000 of their compatriots – Palestinians citizens of Israel – gathered in a forest half way between Nazareth and Tiberias. In the largest Nakba procession ever staged in Israel, they waved Palestinian flags as they marched to Lubya, one of more than 500 Palestinian villages destroyed in the aftermath of Israel’s creation. As has become typical in recent years, the march produced a counter-demonstration: hardline Jewish nationalists staged noisy celebrations close by, fervently waving Israeli flags and trying to get as close to the march as police would allow. Scenes of the Nakba procession – all over social media, as well as the Israeli news – upset the Israeli right. Avigdor Lieberman, the foreign minister, and Israel is Our Home member, called Palestinian citizens who joined the march “a fifth column whose aim is the destruction of Israel”. He added that their rightful place was not in Israel but “Ramallah”, where the Palestinian Authority is headquartered. Numbering 1.5 million, the Palestinian minority comprises a fifth of Israel’s population. Able to reach the destroyed villages, unlike most Palestinian refugees, they have increasingly shouldered the struggle to keep alive the memory of what was lost in 1948. Most Israeli Jews, however, regard efforts to revisit 1948 as a threat to Zionism, said Bronstein. A long-standing consensus in Israel is that any concession to Palestinians on the refugee question could open the door to the right of return, destroying Israel’s Jewish character. Im Tirtzu, a far-right youth movement opposed to what it sees as growing anti-Zionist influences on Israeli society, organised protests at several Israeli universities this week as Palestinian students tried to hold Nakba commemorations. Israel has long insisted that the many Palestinians left of their own accord or that their exodus was possibly even coordinated by Arab leaders. Palestinians in turn have always vehemently denied this narrative and insist that the civilian population was forced out. Sights like those at Lubya are likely to fuel a “harsh” reaction from Israel, said Ilan Pappe, an Israeli historian and expert on the events of 1948. “Unfortunately, we are likely to see more draconian legislation in the future and the possibility of brutal violence,” he said. The Israeli parliament has already passed a law preventing any publicly-funded institution – such as schools, universities and libraries – from providing a voice to the Palestinian narrative of 1948. Pappe said an announcement last month by Israeli prime minister Benjamin Netanyahu of new legislation to define Israel in exclusively Jewish terms indicated further efforts to eradicate discussion of the Nakba and Israel’s responsibility. Ziad Awaisi, one of the Nakba march organisers, said such moves were only galvanising the resolution of Palestinians on the refugee issue. 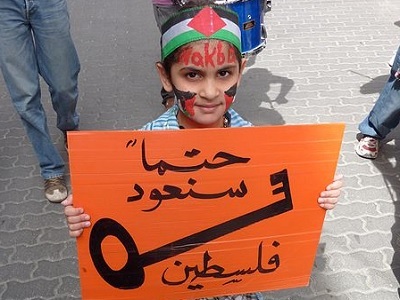 “A new, young generation is ready to be more assertive about the Nakba and the rights of the refugees. They are willing to confront the Israeli authorities,” he said. Estimates are that one in four Palestinian citizens of Israel belongs to a family expelled from its home in 1948, making them a potentially powerful force in Israel for a historical re-evaluation. The “March of Return” has been held annually since 1998, each year to a different destroyed village. In recent years, the number of participants has swelled dramatically, with young families and youths playing an ever greater part. The erased village of Lubya is covered by a pine forest known to the Jewish population as Lavi Park and nowadays chiefly visited by walkers, cyclists and families out for a barbecue. At Lubya, refugees spoke longingly of their desire to return to a village that was once home to nearly 3,000 Palestinians. 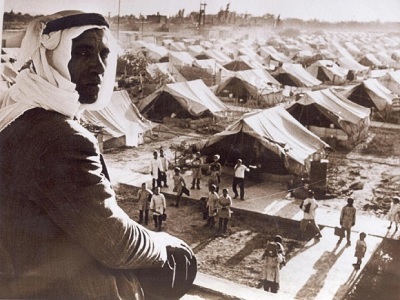 Many were among the 750,000 Palestinians forced out of the new state of Israel in 1948 and into refugee camps across the region. Awaisi said the large attendance at this year’s march may have reflected in part the fact that a significant proportion of Lubya’s refugees ended up in Yarmouk, a camp in Damascus that is now caught in the midst of Syria’s civil war. Nakba initiatives inside Israel are taking off on various fronts, adding to the tension with Israeli Jews. Last week Zochrot launched a phone app called iNakba, the first of its kind. In three languages, English, Arabic and Hebrew, it flags up on an interactive map all the Palestinian villages destroyed in 1948, allowing users to locate them and share information. Jeries said it had been an instant success, gaining thousands of downloads on its first day. For the past decade Zochrot has been running regular visits for Israelis to the ruins of different villages, often buried under pine forests and hidden inside gated communities reserved for the Jewish population. Zochrot has created a “nakba kit” for teachers, though it is barred from use in the classroom by education officials. The group has also created an archive of filmed interviews with veteran Israeli fighters from the 1948 war, who admit their role in expelling Palestinians and, in some cases, participating in massacres. 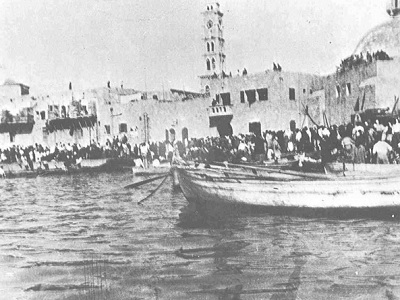 Most Israeli Jews are still taught a long-discredited narrative that Palestinians fled under orders from Arab leaders. Last year Zochrot held the first-ever conference on the practical implementation of a right of return, at a time when most Israeli Jews still reject even the principle. Groups of refugees inside Israel have been trying to reclaim mosques and churches, usually the only buildings still standing in the destroyed villages, defying Israeli orders that have typically declared the ruins “closed military areas”. In two destroyed Christian villages in the Galilee, Biram and Iqrit, youths have set up encampments next to the surviving churches, daring Israel to force them out. Such efforts are leading to confrontations. Last month a refugee family that tried to hold a baptism in a church at al-Bassa, now the industrial zone of the northern Jewish town of Shlomi, was attacked. A group of Jewish residents reportedly called them “stinking Christians” and smashed the camera of the official photographer. At other sites, such as at the historic mosque of Ghabsiyya, east of Acre, Israeli authorities have been trying to prevent refugees from using the building by sealing it off with razor wire and high walls. Jonathan writes that “Israel has long insisted that the many Palestinians left of their own accord or that their exodus was possibly even coordinated by Arab leaders.” The reason that a person leaves their home is irrelevant. They might have wanted to go bowling, or pick up some smokes at the store. The great crime of the Nakba is the state of israel’s denial of the inalienable right of people to return home from bowling, or picking up smokes, or fleeing zioterrorists. Remedying this ongoing crime was a condition for israel’s acceptance to the U.N. Failure of the state to live up to that commitment is an indictment of the legitimacy of both israel and the U.N. They have to face the nakba during their so called independence day and cannot avoid it? that’s good, may they never see peace in their whole life may every soul they took and every tear they shed from every Palestinian mother hunt them their whole entire lives, I hope they pay for the destruction of the Middle East.